David Jones’ drive for its Elizabeth Street store to be a global premier retail destination has been boosted by a new partnership with Disney, as well as exclusive partnerships with iconic, luxury global brands, Louis Vuitton, Chanel and Gucci. It comes at a time when bricks and mortar retailers are struggling, particularly after Amazon's launch in Australia. Savvy bricks and mortar operators are looking for ways to make stores destinations and to create new ways of connecting with customers, to lure consumers back. 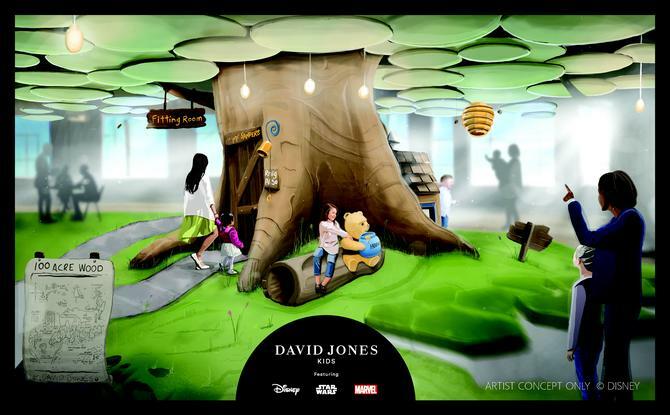 As part of the $200 million Elizabeth Street store redevelopment, David Jones and The Walt Disney Company (Australia and New Zealand) have announced a new children’s world featuring Disney, Star Wars and Marve. The joint partnership will see the top floor of the Sydney flagship location transformed into a magical, one-of-a-kind destination. The children’s floor will offer five distinct neighbourhoods designed to transport customers to different mini worlds and immerse themselves in Disney’s much-loved stories and characters. Key elements of the children’s floor experience will include: 100 Acre Wood, with views over Hyde Park and shareable moments under the canopy of Winnie the Pooh’s much-loved honey tree; Marvel - Time to suit up! Roam this New York-inspired locale and then head over to the Brooklyn-inspired loft story-telling area to explore the world of books, games and puzzles; Star Wars – featuring contemporary apparel for the young Padawan in a world of play, interactivity and technology; Disney Princess - Dreamy visions of fairy lights, castles, carousels and a Magic Mirror; High Street - a premium range of boutique shops. Also as part of the redevelopment, David Jones has struck store exclusive partnerships with Louis Vuitton, Chanel and Gucci. In a first for Australia, customers will be able to experience the worlds of Louis Vuitton, Chanel and Gucci outside their eponymous boutique stores. Each of these iconic brands will have bespoke boutiques in David Jones Elizabeth Street’s new luxury shoe floor due to open on its renowned seventh floor in late September. Louis Vuitton will also feature a women’s universe store within the reimagined luxury ground floor. Ground floor Elizabeth Street will also include Gucci’s latest instore design aesthetic and present its accessories, watches and jewellery collections. David Jones chief executive officer, David Thomas said, the commencement of the Elizabeth Street store redevelopment and the major partnerships represent a significant milestone for David Jones in its 180th year..
“The redevelopment of Elizabeth Street will celebrate the heritage of our beautiful flagship store while delivering an exciting and innovative new retail experience in the heart of Sydney’s premier shopping precinct. We have reimagined every aspect of this store to present our customers with an enriched and engaging experience on every floor, especially our new children’s floor. With the recent announcement of our new luxury designer partnerships with Louis Vuitton, Chanel and Gucci, and this exciting partnership with Disney, our new Sydney flagship will be Australia’s premier retail destination,” he said. Senior vice-president and managing director, The Walt Disney Company Australia and New Zealand, Kylie Watson-Wheeler, said the partnership combines a premium vision for David Jones’ flagship store with Disney’s own stories and characters to create a world-class retail destination that will delight both children and adults alike. Level nine will open in late November, with further floors to open next year and the full refurbishment to be completed in early 2020. David Jones is working in conjunction with architectural firm Benoy on the redevelopment.